Scott Robbins: Dear Delon, Congratulations! For two reasons. First, you are the farthest destination that I have given a golf tip to in the world. Secondly, for some great work you have done to get to the level of play you have in one year. that’s FANTASTIC! To answer your questions, to become a professional golfer is just as hard (if not harder) than any other profession. It takes the same dedication, knowledge and work that it does to become a doctor, lawyer or any other highly respected profession. To become the best player you can, I have a few suggestions. First, continue to play and practice as much as you can. If you have unlimited resources, make that an 8, 10 or 12 hour a day practice. Secondly, find an instructor who is experienced in training great players and get him to work on your golf swing and game and set up a training schedule for you. Third, find players that are a lot better than you are and go play with them and play with them as often as you can. You will learn from them. How they swing, how they hit shots, how they work around the golf course and how they think. This can be one of the most valuable things you do, if you keep an open mind to what you are watching. Don’t be afraid to ask questions. Use all the opportunities you can to learn. A slice or fade always comes because the clubface is open to the path the club is swinging into the ball and can also be influenced if the club is too steep into the ball. First work on learning to square and/or close the clubface at impact. Secondly, check your shot pattern. If the ball starts left and then fades, the path is from the outside. Try to start the ball to the right of target and make it hook back to the left and to target. A great player from your country hit almost every golf shot like that, including his putts. Bobby Locke was one of the greatest players from before you were born. Work then on your grip to find one that will allow you to square or close the face at impact and also on a swing that will create a more in to out swing path. 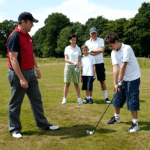 Find a golf professional who is a great instructor and take some lessons. Also, in regards to clubs, have a golf professional fit you for the clubs. If you want to be a great player, have your clubs fit to you and your swing instead of buying something and having to adjust your swing to the clubs. Good Luck. Let me know how you progress. Nicholas Birdsong of Tampa, Florida writes: I want to start playing, but I am black so it is extremely difficult for me to find a place to play, what kind of advice would you give me on starting to play the game and finding a place. Scott Robbins: Nicholas, There are some great programs the PGA of America sponsor that would fit up your alley. The community golf programs, Clubs for Kids and First Swing Program are a few. Contact either a local PGA Professional or the PGA of America office in Palm Beach and find out where one of those programs are in your city so you can start enjoying this great game. If you have problems, write me back and I will see what I can do. Kevin James of San Antonio, TX writes: I am a fifteen year old golfer, I am dealing with a fade/ slice. I would like to get to a nice draw. My main problem is with my drive. My iron game is alright, but my woods are fading and going nowhere. I would apreciate your help. Thanks. Scott Robbins: Kevin, Slices and fades come from an open clubface that is open to the path and angle the club is swinging on. The face could be open due to your grip. Your path could be across your body and the clubface looking away from your body. Check these areas. If your divot points to the left of target and is deeper on the outside than the inside, then you are swinging across your body and the clubface is open. Find a grip that will square or close the face and start swinging the club in a way to make your divots look at target or to the right of target. Shawnda Coffee of Stinnett, TX asks: How do I become a better putter? Scott Robbins: Dear Shawnda, To become a better putter is to understand the basic need to make any putt whether it is from six inches to sixty feet. To make a putt, you need to have the correct distance and the correct direction for each putt. Of the two, distance is the most important. Here are a series of drills you can do to improve your putting. Work hardest at this part of the game. It is over half the game. It is the quickest way to shave strokes off your scoring average. And once you learn to putt and create confidence in your putting, you will always have a feel to go back to and putt well almost every time. Good Luck. Keep practicing. Practice the right things and watch how quickly your game will improve! Hunter Watts of Keswick, VA writes: My idol is Corey Pavin. I’m very small for my age and hit even shorter off the tee. I play on long course that is about 7000 yards, so how can I increase my distance without losing my accuracy because that is my major strength? Scott Robbins: Hunter, Whenever you start increasing distance through club head speed you risk losing accuracy because not only are your good hits amplified but so are your mistakes. The first thing to do is concentrate on the second factor of distance, solid square contact with the golf ball. After you are hitting the ball in the center of the face every time, then you can begin working on increasing speed through a bigger and wider swing arc. Seek a good PGA Professional and good luck with your golf game. Josh Hartloper of Anderson, S.C. writes: I have problems with fighting a closed club face at the top of my swing. I fight my club take away position at 9:00. What are some good tips for correcting these problems, and what are some good drills? Scott Robbins: Josh, Check your grip first. Be sure it is square at address and at 9:00. At 9:00 the face should be parallel to your spine. Find your nearest PGA Professional and have him check your grip and takeaway and recommend some specific drills to correct you specific problem. Justin Northcutt of Charlotte, NC writes: I’m an 8 handicap at the TPC at Piper Glen. I really believe I could play to 2 by staying loose and focused during the round. Especially off the tee sometimes, I won’t get fully set at the top. Any suggestions? Scott Robbins: Justin, First, congratulations on some great playing for your age!! You can be very proud of that if you chose to. Also congratulations for the desire to make such a huge improvement from your current 8 handicap. Staying focused is really difficult at any age. The best way is to first learn when you need to be focused and how to be sure you are when you need it. First, when do you need to be focused. Only when you are getting ready to hit your shot. Any other time is adding to your stress and mental fatigue that naturally happen during a round of golf. It should take only about 20 seconds or less to execute any golf shot from start to finish. 1) a starting signal that will tell your mind it is time to hit a golf shot. Get those two routines incorporated in your practice and shot making on the golf course and it will serve to give you a way to prepare to hit each golf shot the exact same way. Good luck. Let me know how your new mental approach helps your scores. Scott Robbins: Kyle, To get your front side though, you must be sure the club and the body are being delivered to impact at the same time. If you feel you are waiting for the club to hit the ball then you body will almost always work upwards and never allow a good finish. After you check the delivery of the club you should then feel you are swinging your hips and shoulders more level through impact. At your age this winter, the best thing is to get a weighted golf club. That more than anything else will build all the correct muscles. While your are swinging that club, feel the balance of the club and your body throughout your swing. The lighter you get it, the better you will swing it and learn to get to that full finish. Sam Albarano of Lilly,PA writes: I have been playing golf for about three years and now it seems the only thing standing in the way of scratch level scores is my mental game. I seem to be beating myself up on the course hich is causing my scores to be very inconsistant. I love the game and would love some assistance in this area. If at all possible I would like to be able to write to Bob Rotella. I hear he is the best at this kinda stuff. Scott Robbins: Sam, Dr. Rotella is a wonderful idea. First I would suggest getting his latest book. I believe the title is Golf is not a game of perfect or something to that nature. Then you can get his address and write to him. Basically, to be better to yourself on the golf course, you have a choices. The main choice it sounds like you need to make is to choose to be your own best friend and coach on the golf course. What I mean by that is think how a great positive coach or friend would be saying to you when you are down or have made a mistake. Now talk to yourself that way. Get Dr. Rotella’s book. One of his students is Dr. David Cook at University of Kansas. He has a book and some tapes out that you might find useful also. Kristy in B.C writes: I want to know how to get started in a golf career? Scott Robbins: Kristy, There are many ways to get started. First, at your age you can start considering attending a college or university with the PGA PGM (professional Golf Management) Program. This 5 year college program will earn you credits and achievements towards membership in the PGA of America apprentice program. Furthermore, these programs also help place you or assist you in finding and securing an apprenticeship at a golf facility. For more specific information, write the PGA of America at their homepage at http://www.pgaonline.com. Jabba in Hartland, New Bunswick, Canada writes: I am a left handed golfer. I was told that when I am hitting my irons I should pinch the ball between the ground and my iron. Where should the ball be in my stance with my irons? Scott Robbins: Dear Jabba, There was a golfer 51 years ago that won 11 tournaments in a row, 13 in a year and has the lowest scoring average on Tour that to this day has not been beat. When Byron Nelson did all this in 1945, he rarely if ever took turf (cut a divot). He swept almost every shot he hit. A small shallow divot however is okay. To ensure proper ball contact with the irons, the ball should be slightly forward of your sternum, but not as far up as your armpit. You are trying to connect with the back of the ball, not the top. Considering a good repeatable swing plane, that should encourage better ball striking.